Join us on 08/02/2017 on our Facebook event to ask ONE FREE QUESTION* to the incredible Kat EXT 7054. Summer is in full swing and we wanted to give our loyal followers and fans the chance to see what the future holds for free!Don’t miss out! All you have to do is “Like” and “Share” the event on Facebook at Psychics Foretell, and post your one free question on our Facebook event page or send it to our private messages. Kat will be answering questions between 8am-12 pm EST on August 2nd, 2017. Links to our social media pages can be found at the bottom of our home page (look for the Facebook button). * You must ‘Like’ and Share our event on Facebook. The one free questions can only be 2 sentences long. You must be over the age of 18 and it must be verifiable by being displayed on your profile. Join us on 07/05/2017 on our Facebook event to ask ONE FREE QUESTION* to the incredible author and psychicFranklin EXT 7079. Summer has come and we wanted to give our loyal followers and fans the chance to see what the future holds for free! Don’t miss out! All you have to do is “Like” and ‘Share’ the event on Facebook at Psychics Foretell, and post your one free question on our Facebook event page or send it to our private messages. Franklin will be answering questions between 11am -2pm EST on July 5th, 2017. Links to our social media pages can be found at the bottom of our home page (look for the Facebook button). * You must ‘Like’ and Share our event on Facebook. The one free questions can only be 2 sentences long. You must be 18 or older and it must be verifiable by being displayed on your profile. This past year seemed to hit everyone pretty hard and we want to make sure the remainder of those bad feelings are gone. We are so glad when a client calls back to say one of our psychics said something so simple that helped them so much and it made them feel so much better; even if it’s not what they wanted to hear, they needed to hear it. Knowing that we provide a service that helps people daily is a wonderful thing. We have decided to take it one step further… Check out our latest press release to read more. Make sure to follow us on our social media pages to keep up with this story and for special contests, events, news, discounts and more! Here’s links to our FaceBook, Twitter, and Pinterest! 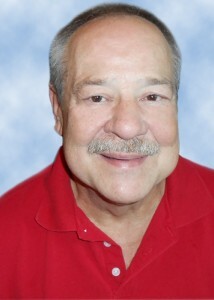 Online Q & A Event with Live Psychic Mediums. For more information on this event please check out our latest press release here http://www.prweb.com/releases/2013/10/prweb11250964.htm. 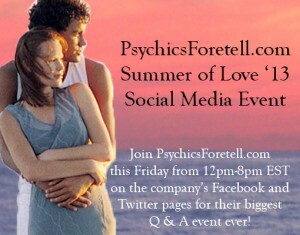 Summer Love FREE Online Q & A Event. Join us this Friday, June 7th, from 12pm – 8pm EST on our Facebook and Twitter accounts to ask ONE FREE QUESTION to one of our on hand love experts. Summer has officially kicked off and we wanted to give our loyal followers and fans the chance to see if your summer is going to be extra steamy or if a hot new fling is in the works. Don’t miss out! It’s simple. 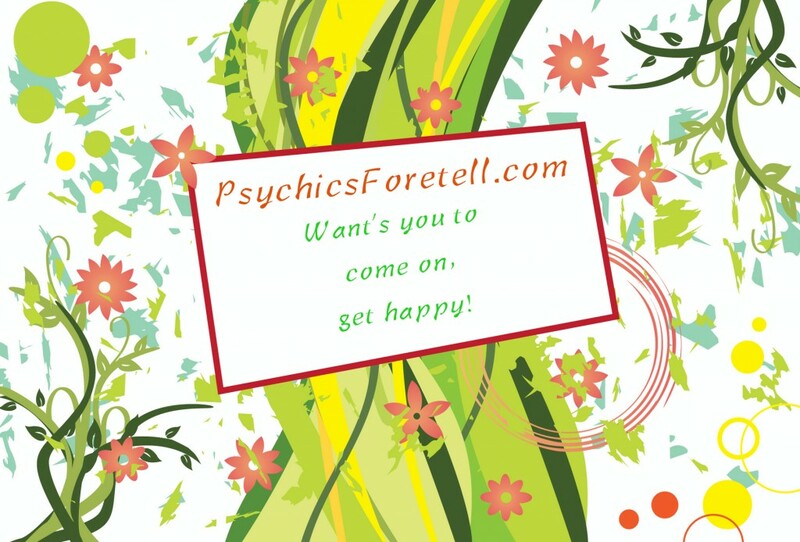 All you have to do is “Like” us on Facebook at Psychics Foretell and post your one free question on our wall. Don’t have a Facebook account? 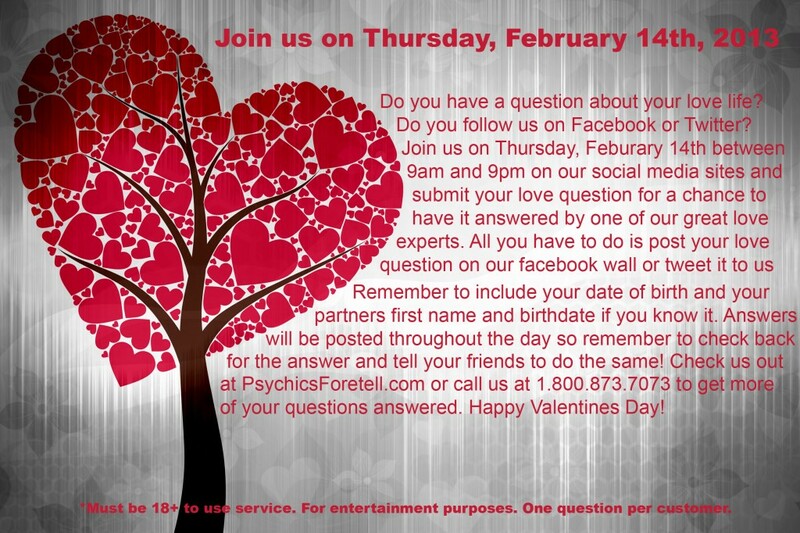 Not to worry, you can also follow us on Twitter and tweet us your one free question @psychicforetell. 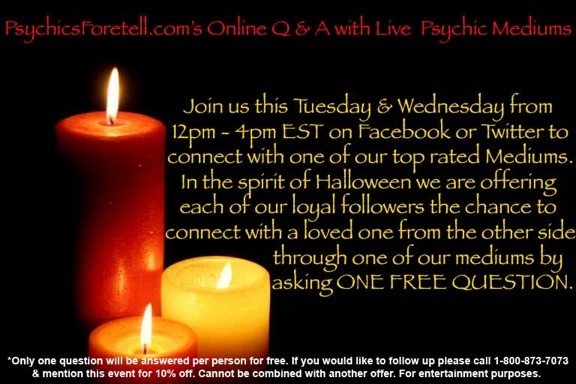 Psychics will be answering questions throughout the day between 12pm-8pm EST. Links to our social media pages can be found at the bottom of our home page. Look for the Twitter and Facebook buttons. Featured psychics will include Adam, Carol, John, Margie, Mary, Michelle, Spirit, and Vicki…and possibly more joining in later! Check out our Find A Psychic page to read over their bio’s and see who you may want to ask your question to or you can simply ask your question and one of the wonderful advisors will give you your answer. To keep things fair, each fan and follower is allowed only ONE FREE ANSWER. If you would like to ask more questions or find out more please call 1-800-873-7073 to set up a reading with one of our advisors.